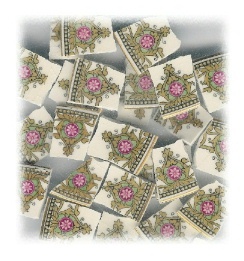 25 tiles from Grindley china plates. White daisy on fuchsia circle, green accents, gold scrolling, narrow black band on edge with gold dots, gold rim on white china. All rim tiles.